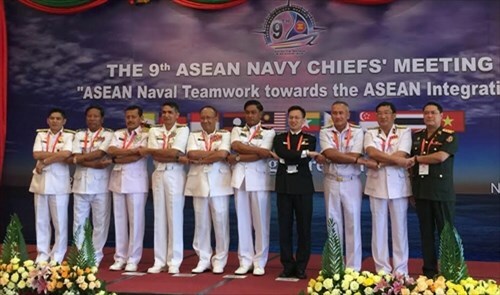 A Vietnamese delegation led by Rear Admiral Pham Hoai Nam, Commander of the Vietnam People’s Navy, is participating in the 9th ASEAN Navy Chiefs’ Meeting (ANCM-9) held in Myanmar on August 19-22, according to Quan doi Nhan dan (People’s Army) newspaper. Discussions at the annual meeting this year focused on the theme “Fostering ASEAN Naval Teamwork in Regional Maritime Security” as well as important documents and orientations regarding the cooperation between ASEAN naval forces such as the ANCM Roadmap, regulations on humanitarian and disaster relief assistance, multilateral exercises, anti-piracy measures, and basic concepts on ANCM+. Navy chiefs also talked about plans on an international ship parade in celebration of 50-year ASEAN in 2017 along with preparations for the ANCM-10 and increasing exchanges between young naval officials in the bloc. Ahead of the event, Commander of the Vietnam People’s Navy Pham Hoai Nam had bilateral meetings with partners from Myanmar, Brunei, Cambodia, Malaysia, the Philippines, Singapore and Thailand on important issues of mutual concerns.